Parenting is hard work. Any parent will tell you that. You have great days when you can’t seem to wipe the smile off your face because your heart is so full of love for these little people that call you ‘Mum’, and not so great days, when you want to hide in a cupboard with a packet of chocolate biscuits, a glass of wine and a pair of noise-cancelling headphones. I’d walk through fire for my kids. I’d be likely to go all Liam Neeson from Taken if anything ever happened to them. But this parenting thing is bloody hard work. I started to compile a list in my mind of things I wanted. Things I’m pretty sure most parents would relate to and want, but can’t be bought. I want to sleep a restful sleep and wake up in the morning not feeling or acting like a zombie. I don’t want to wake to the sound of one child teasing the other child and have it quickly escalate to tears and a tantrum. I want to actually enjoy my fantastic, soul-nourishing coffee at a leisurely pace in the morning. Not knocking it back in three gulps while making lunches. No interruptions from a toddler screaming like a banshee because his cereal spoon is on the floor, because he threw it there. Or drinking the coffee cold, because I don’t have the speed of The Flash to be able to get to the toddler in his high chair before he flings his cereal bowl all over the floor, resulting in having to clean the floor before the dogs walk through the cornflakes. Me reminding him and sounding like a broken record doesn’t work, a reward chart doesn’t work, a list in his room of the chores he has to do for him to refer to doesn’t work. He can’t remember to brush his teeth, but he can name about six droids from Star Wars. My husband didn’t even know there were that many different droids. I couldn’t care less about the droids. I just want him to brush his teeth. I want our seven year old to not draw on the bathroom mirror in liquid soap, suncream, moisturiser or toothpaste, for just one day. I know it is him that does it, because he writes his name… Genius, I know. I know by saying I want these things, I am probably sounding like the whinging children I am whinging about. But you know what? I’ve experienced so many epic tantrums and listened to whinging over dinners for almost every night for five years, I feel like I’m entitled to a tantrum of my own. If we miraculously get a great day with the toddler, where he doesn’t try to bite inanimate objects out of frustration – the dining table, child safety gate on the stairs, drawer handles – or bite his brother, or hurl a fork across the dinner table that grazes past our heads, then his older brother gets his cranky pants on. It is exhausting just thinking about it. I’m trying to pick my battles. I’m looking for short cuts or #lifehacks to try and make things smoother. I’m trying to not get stressed about it. I’m telling myself that I’ll look back in the future and laugh at these times. Or at least have some cracking stories to tell at their 21st birthdays. I want someone to pour me a big glass of red wine, point me to a comfy chair in a quiet spot where I can sit, and maybe close my eyes. I’m tired. Some days, it truly feels like hostage negotiation. What about you? 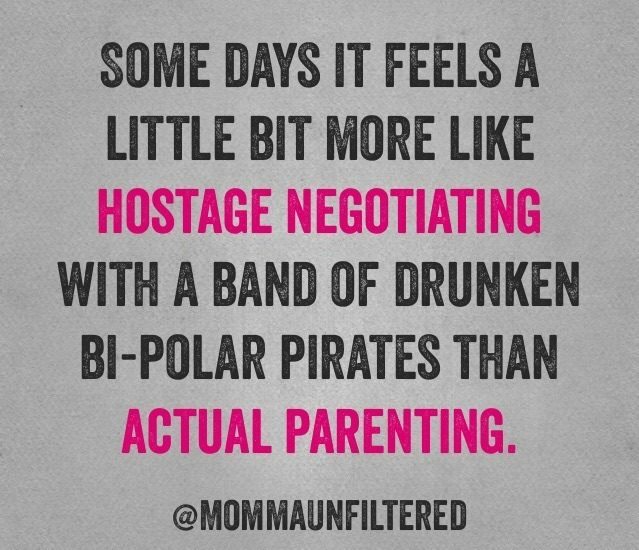 Do you feel like a hostage negotiator some days? Make sure you’re following Life, kids and a glass of red on Facebook for extra giggles and snippets of sillliness! Buy yourself some noise cancelling headphones and a nice bottle of redcfor Valentine’s Day! Yep, I am exhausted and I’m begging for a break before I snap. This morning my husband said “Well, have a break.” flippantly while walking out the door to work. I think we’re allowed a tantrum every now and then – you’ve got to get this stuff out, right? And, honestly, I would have liked to have read how real life with kids would be before I had them. It was all a bit of a shock! I hope you get what you need soon and I think Mumma McD is onto something there! I think every parent of young kids feels exhausted a lot of the time. The problem is they’re so used to it that they forget that life isn’t always like this. I know that I think I’ve had a good night when I’ve only been interrupted two or three times instead of four or six or eight. And I seem completely incapable of enjoying my me time because I’m always trying to get ahead of the madness. Still I keep my eyes focused on the future. I don’t want my kids to grow up too fast, but I’m sure looking forward to it at the same time! I want sleep and quiet time to myself, is all I want when my husband asks me what he can do to help out. Sometimes I feel like they’re in charge the way the boss ME around and I cater to almost all their needs. Tough gig parenting but I know now we’re all doing the best we can. Thinking of you Mumma. Hope you get some sleep soon! I think we all need to do a bulk order of noise cancelling headphones! OH-EM-GEE I can relate to so many of these! (Although I have an almost 3 year old and a newborn so different ages to your little ones but still). I want sleep and coffee too – and to leave the house on time – today we were late thanks to the 1 month old’s poo-spolosion! PS – your husbands “what would you like at the shop” comment reminded me of when my husband says “well that night wasn’t too bad” 😦 GRR! Makes me see red when he slept through the whole ordeal!! Can totally relate to leaving the house late thanks to a poo-splosion! Resulted in a full change of clothes for bub, change top for me and clean out car seat, because of course, the explosion occurred as soon as I put him in his car seat…. I also want the teeth brushing to happen. And socks to be picked up. Or things put away instead of dumped on a floor. I want people to think for themselves and not rely on my memory all the time. I hope you get a much needed break soon x Parenting is really, really hard work but luckily the rewards are pretty good. Oh and I hear you about Groundhog Day!! Urgh, Groundhog Day. A small break every now and then gives us more energy to get through those not so great days. Glad I’m not the only one. If you bring wine, I’ll pour a big glass for you too! I have a bit of a rant in my drafts folder about wanting long service leave from life!! So yep, I relate. Long service would be fabulous 🙂 Hope you get a break soon too. HAHAHHAH my kids are in bed right now and I did not need to read this. Now I feel tired. LOL! Damn, this post hit hard tonight. Mr 6’s sleeping has been atrocious lately and I’m exhausted from having to deal with it on my own. Over the holidays I just wanted some time to myself with absolutely no interruptions. My partner thought that me locking myself in my room where I got to listen to Mr 6 scream out to me that he couldn’t find something to eat, to put the password into netflix or any other things that obviously only I can do, was the same as time out. It’s not even close. Oh no. I hope you manage to get a break soon. I think we need to do a bulk order of noise cancelling headphones and a case of wine, and divvy them out to all the mums! We have a similar gap in ages between kids, only 12 (our daughter who has been in full on teenage mode for a while now) and our son, 6 today. What I wouldn’t give for a day without fighting! 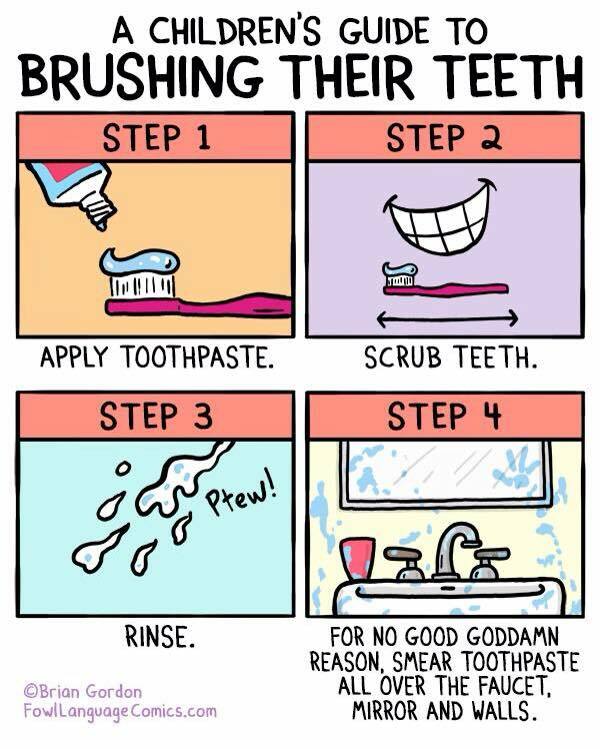 Remembering to clean teeth would be great too (they do get it eventually, I think our daughter remembers most days!). Oh man I hear you on the seven year old boy thing… mine is eight but just the same!!! I hear you! Parenting is the hardest thing I’ve ever done! EVER! Right now I am rocking in the corner, not literally, but I am at breaking point. Today I have a couple of child-free hours that I am going to try and recuperate and refresh. What I am trying to say is I FEEL YOU!! I’m sorry but this post just made me laugh out loud!! I don’t why because it’s my life too – oh how I hear you. I think it was telling the 7 year old over and over what to do in the morning. Mine is 9 and nothing has changed!! I love this post! I”m a grandmother now, so I know what you mean. I went through all this, too. Sometimes I wish I could go back though, do some things differently. Hope you get a good night’s sleep tonight!